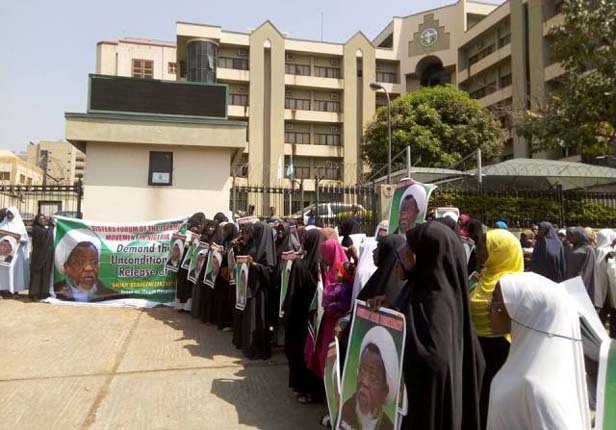 The Sisters’ Forum of the Islamic Movement in Nigeria has criticized the continued detention of their leader, Ayatollah Ibraheem Zakzaky and his wife by the Federal Government. In a statement by Firdausi Ali Yusuf during a protest to the National Human Rights Commission (NHRC) in Abuja, the group decried the detention of Zakzaky for over 700 days since a Federal High Court ordered his release. The group recalled the various attacks against the group by security forces, which has violated their fundamental rights as enshrined in the Nigerian Constitution and international instruments. “It is relevant to remind the Commission that we are in global village and the world through media and intellectuals are aware of the high-handed incident of the killing of innocent Nigerian citizens in Zaria from December 12 to 14, 2015, which is in every respect against what has been enshrined in the Constitution of the Federal Republic of Nigeria, the provisions of the African Charter and the UN Declaration in its Charter in 1945, all on human rights,” the group said. “When those who are paid to protect citizens, and enforce laws turn out to be flouting them or pull trigger at slight or no provocation, impunity is already on the prowl.